You’re currently receiving maximum job matches. We want to make sure that you receive the right services during your job search. In order to continue receiving maximum job matches, please confirm that you’re still Actively Looking for a job. 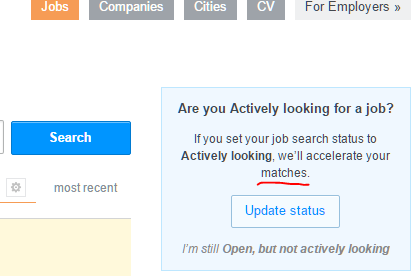 What does "maximum job matches" mean and how does it differ from what I'd receive if I don't click "I'm still actively looking"? Prioritization in our candidate database. When your Job Search Status is set as Actively looking we give your CV more weight when employers search the database for candidates. status-planned Personalized job recommendation emails. When you're Actively looking, these emails will be sent more frequently by default. We originally planned to roll this out earlier, but other work got in the way and we had to push this back. We're currently looking to get this out in January. For the folks working on these features, the original verbiage seemed adequate. Obviously we were wrong. We're currently updating the wording, and going forward we'll work harder to have feature copy reviewed by fresh-eyed folks that aren't on the implementation team living and breathing those features every day. You’re currently marked as actively looking for a job. Is this still correct? If you are actively looking for a job, we’ll prioritize your CV and work hard to get you the maximum possible matches with companies as quickly as possible. If you're not actively looking, you can still mark your CV "open, but not actively looking" and we'll send you fewer, more selective matches. Not the answer you're looking for? Browse other questions tagged support status-completed careers email .